The Hypercarnivore Diet: Wheat Belly Challenge D24: Wheat Stimulates Appetite? Wheat Belly Challenge D24: Wheat Stimulates Appetite? So, after quitting gluten, out of 215 total patients, 91 gained weight, and 25 lost weight. The ratio of gainers to losers was nearly 4:1, suggesting that if you truly have celiac disease or gut inflammation due to eating gluten, and you stop eating gluten, you are nearly 4 times more likely to gain weight than to lose weight. This is expected because if you have true gluten intolerance, you have a host of gastrointestinal symptoms that indicate poor nutrient absorption. 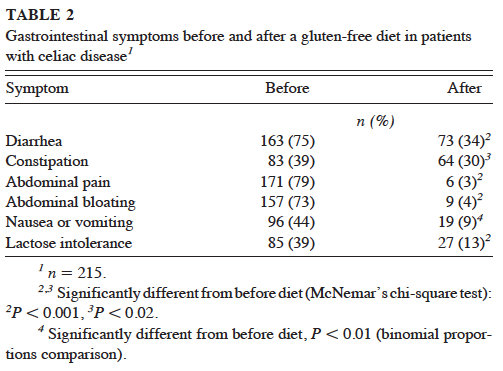 In this study, before gluten avoidance, 75% of the subjects had diarrhea and 44% had nausea or vomiting. Stopping gluten intake relieved many of these subjects of their gastrointestinal symptoms, which indicated that their guts were working more effectively to digest and absorb nutrients, resulting in weight gain. Among both males and females in this study, obesity decreased with gluten avoidance. 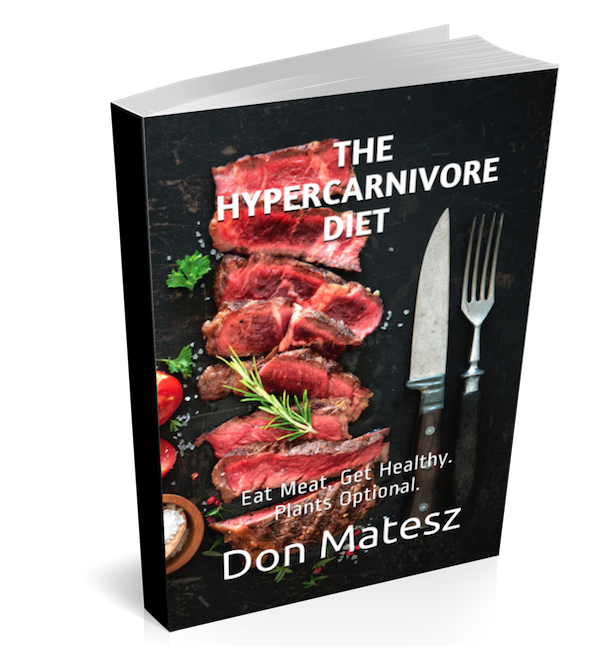 This could simply be due to having a smaller selection of foods to choose from, as well as a decline in consumption of those energy-dense foods that commonly accompany wheat, such as margarine, butter, mayonnaise, lunch meats, and so on. Elimination of wheat also entails eliminating sugar-and fat- rich, energy-dense cakes, donuts, pastries, cookies, Twinkies, Ding-Dongs, and so on, for which gluten-free substitutes are difficult to find, more expensive, or unknown. In other words, for many people, cutting out wheat involves cutting out calories from sugar and fat as well as from wheat. This can lead to weight loss, but doesn't show that the wheat was responsible for their overweight condition. 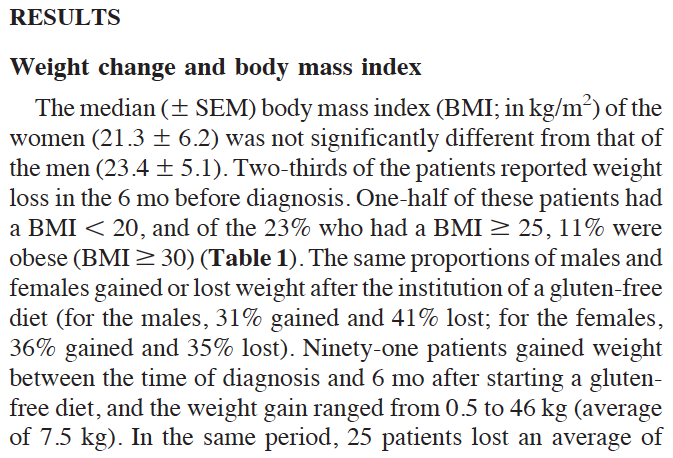 However, it is rather interesting to note that among these celiac patients, 15% of men and 12% of women were either overweight or obese. The "wheat belly" hypothesis that wheat-eating makes gluten-sensitive people highly prone to obesity implies that celiacs who have not yet given up gluten will have a higher risk of obesity than the general population. According to the CDC and this study, in the U.S. general population, 34.9% of adults are classified as obese. 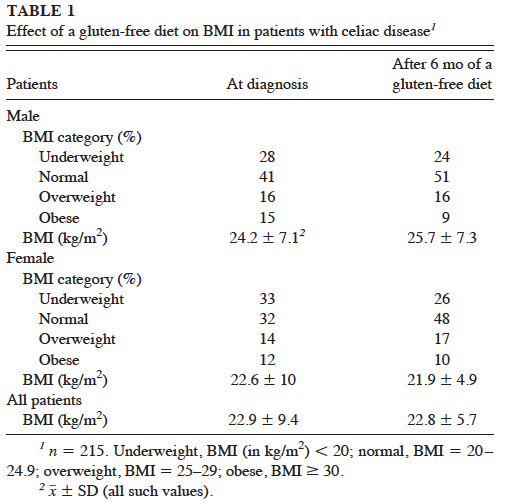 This means that among these celiac patients, obesity was less than half as common as among the general population! It appears that wheat-sensitive individuals are less prone to obesity than the general population. This stands contrary to Davis's claim that wheat-sensitivity makes one more prone to obesity, and is consistent with the expectation that people suffering from undiagnosed celiac will be less prone to overweight and obesity due to the negative effects that gluten consumption has on nutrient assimilation in celiacs..
As noted above, there is a very straightforward, simple explanation for the finding that some celiac patients lose weight after adopting a gluten-free diet, and this explanation (less variety of foods, less energy-dense snack and dessert foods, less intake of energy-dense condiments frequently consumed with wheat products) is consistent with the fact that gluten ingestion itself tends to reduce nutrient absorption in celiac patients. In contrast, Davis's hypothesis appears to require one to accept that wheat gluten consumption both reduces macronutrient absorption and increases deposition of fat, despite the fact that reducing macronutrient absorption would reduce energy supplies to the body, whereas increased deposition of fat requires surplus energy supplies.